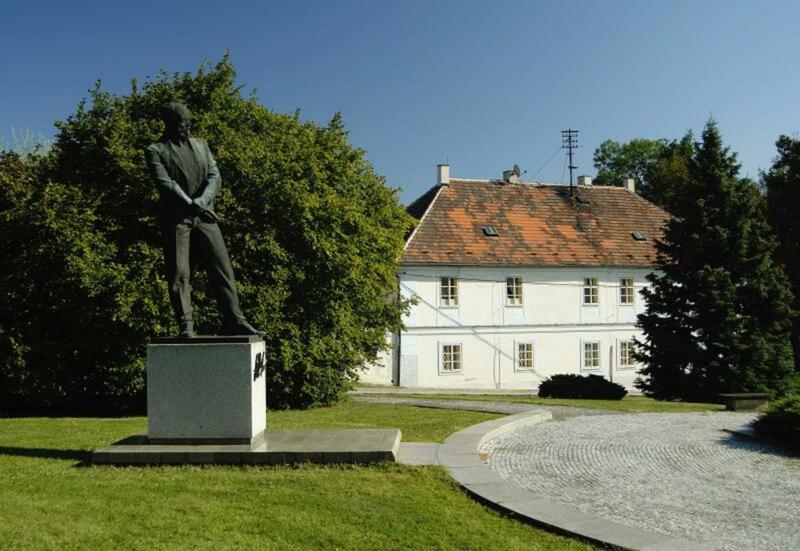 The Antonín Dvořák Memorial in Nelahozeves The Antonín Dvořák Memorial was opened to the public in 1951 in the building where the composer was born in Nelahozeves. This village, mentioned in written records already in the mid-14th century, lies on the west bank of the Vltava not far from Prague. Its long history is evidenced above all by the massive Renaissance castle, decorated with sgraffito, and the little church of St. Andrew (svatý Ondřej) with its original Gothic font in which the future composer was baptized. Dvořák was born on 8 September 1841 in the building that housed the local tavern, adjacent to the butcher’s shop of his father František. This complex and the castle are both owned by the Lobkowicz family. 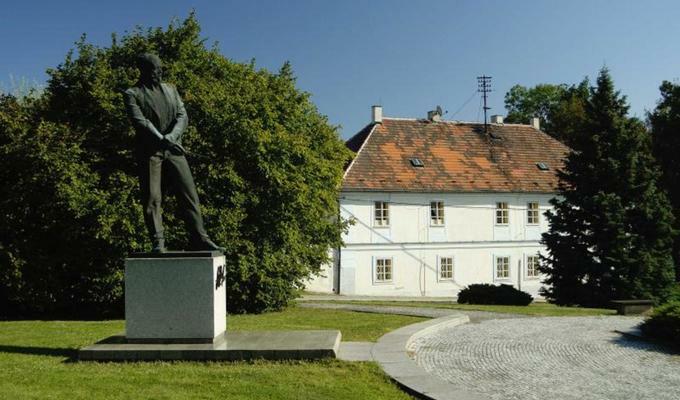 The permanent exposition devoted to Dvořák’s life, with emphasis on his youth spent in Nelahozeves and its environs, is predominantly of a pious, commemorative nature. Dvořák spent twelve years here, from which unfortunately only one item of memorabilia has survived: a prayer book presented to him by Prince F.K. Lobkowicz. However, the exposition includes additional authentic items from his personal effects and household. In one room, furnished as a middle-class salon, the visitor can view his rocking chair and a display case with various items such as goblets, a pitcher, and a plate with portraits of American presidents that he brought from the United States. 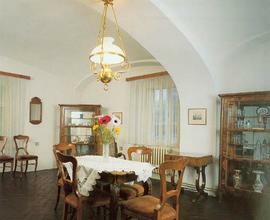 Placed in the room where Dvořák was born is a bust of the composer by Ladislav Šaloun, along with documents concerning the history of his family and materials pertaining to the construction of the railway through Nelahozeves–an event that probably formed the initial stimulus for Dvořák’s life-long admiration for technology, represented at that time above all by locomotives. 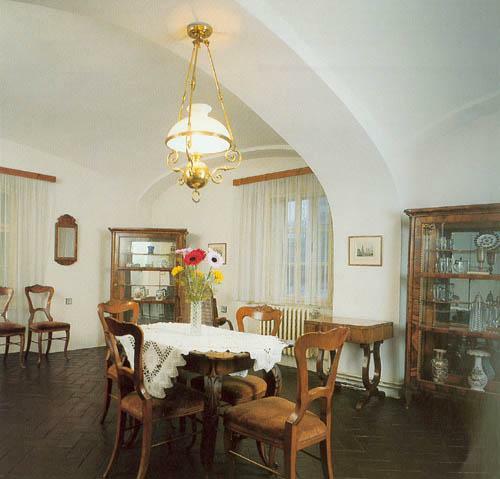 Presented in the former dance hall, whose vaulting is supported by a massive column necessitated by the room’s relatively large dimensions, are the places of Dvořák’s residence and work, the rise of his fame in the Czech lands as well as abroad, important compositions, and persons who influenced his career. Also displayed here is a unique portrait of the composer from the late 1870s when his international acclaim was just beginning, a feather pen, a silver commemorative wreath, one of his violas, and the above-mentioned prayer book. Found in the adjacent room (the former kitchen) are materials pertaining to his work as a teacher and especially the significance of his music: portraits of well-known performers, samples of published editions of his works, and professional Dvořák literature. Each year in September a commemorative morning program is presented in the memorial. Personal contact with this environment, which influenced the composer throughout his life, makes a very strong impression. 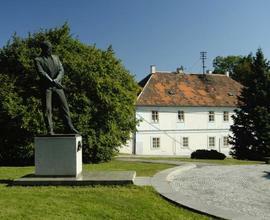 Important dates from the memorial’s history: 1951 The building where Dvořák was born opened to the public. 1971 Installation of a long-term exposition designed by Karel Mikysa. 1991 Updating of the exposition for the 150th anniversary of Dvořák’s birth.